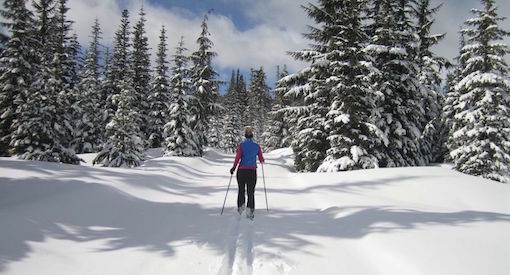 Cross Country Ski touring: Travel on skis on snow covered terrain in natural snow conditions. Skate skiing: The skier provides propulsion on a groomed surface by pushing alternating skis away from one anothr. In Track skiing takes place on groomed terrain that has been set with ski tracks using the diagonal stride technique. 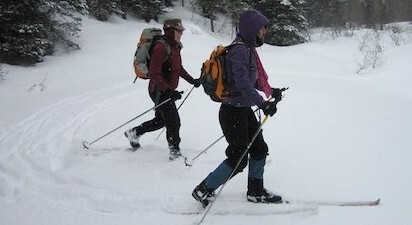 Backcountry skis are wider skis with generous sidecut usually with a metal edge for skiing on more adventurous terrain. Pick up Skis, Boots, Poles RACE WEEK, return after PPP $69. * We recommend getting your equipment early for proper sizing and fit.